Introducing young children to science history offers a way for them to understand the scientific method and the process of discovery. Ideally, they can learn that science doesn’t always take a linear path, and sometimes there are stark reversals. Take for example, the discovery of Pluto, its classification as a planet, and its reclassification in 2006 as a “dwarf planet.” Clearly the definition of planets has taken twists and turns throughout the years. When I received a Guggenheim Fellowship back in 2002, one of the joys it offered was getting a chance to interview some of the greats in the field of physics. A particular pleasure was meeting John Archibald Wheeler, who was a student, collaborator, and mentor of some of the most notable physicists of the 20th century. Wheeler famously coined the expression "black hole." In his 90s at the time, Professor Wheeler still maintained an office at Princeton and visited weekly. When I was researching the history of higher dimensions, a project that ended up becoming my book The Great Beyond, he generously gave several hours of his time for a morning interview. I was very much impressed by his keen memory of certain events of the 1930s through the 1950s, particularly his interactions with Einstein who was his neighbor. Einstein was kind to Wheeler’s children and later to Wheeler’s students. For one of the first relativity classes ever offered, Einstein offered a friendly hand. In 1948, after Wheeler’s student Feynman proposed Quantum Electrodynamics, Wheeler recalled how Einstein was dubious. Wheeler’s sense of humor and gracious attitude were readily apparent. It was easy to see why he was so beloved by his students. At one point I commended him for his book (with Thorne and Misner) Gravitation. He proceeded to show me a copy in Chinese, and dryly commented that I could use the book to learn that language. Wheeler spoke of winning the inaugural Einstein prize for general relativity, along with Peter Bergmann. He had called Bergmann to congratulate him and had left a message, but before they could speak on the phone, Bergmann had passed away. Wheeler showed me some of the photographs of him with certain notables such as Yukawa, and explained his interest in discerning the “why” of life. What a remarkable figure in physics, who contributed so much to modern thought. Wheeler passed away in 2008 at the age of 96. On July 4, two teams of researchers from CERN, Europe's center for particle physics research, made an extraordinary announcement, reporting the discovery of a new particle that appeared to match the profile of the long-sought Higgs boson. One team, using the CMS detector, announced the discovery of a particle with a mass of 125 GeV (giga-electron volts), and the other, using the ATLAS detector, reported a mass of 126 GeV. In tandem, they had found impressive evidence for a major find. The Higgs boson is the relic of the field that filled all of space during the nascent moments of time. In those fleeting instants, as the Higgs field transformed, it lent mass to most of the other elementary particles and caused them to differentiate in their properties. This process, called the Higgs mechanism, is a key ingredient of the Standard Model of particle physics, explaining why there are significant differences among particles. For example photons, the particles that carry the electromagnetic force, are massless and act over a long range, while W and Z particles, carriers of the weak interaction, are heavy and act over a short range. One might use the analogy of water freezing into ice to think of how the Higgs mechanism works. Imagine that the Higgs field in the hot early universe was a sea of liquid water. Other particles moved through the sea like speed boats, each travelling at the speed of light and interacting with each other in the same way. However, as the universe cooled, the Higgs "sea" began to freeze into tracks of slush. Moving through these slush tracks in various directions, most of the particles were forced to slow down, becoming heavier. The amount of mass, or heaviness acquired, depended on the angle that the particle was moving. This led to profound differences in the properties of those particles. 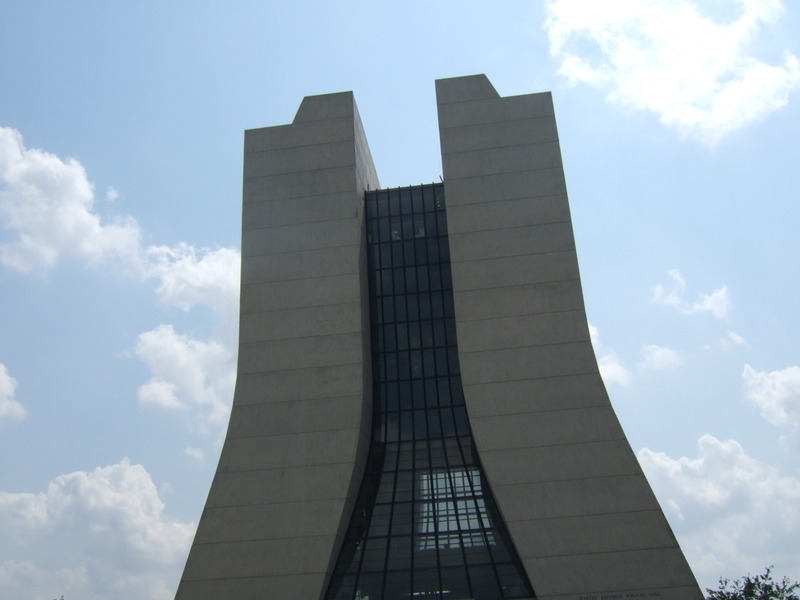 Unravelling the Science of Ray Bradbury's "The Sound of Thunder"
The Physics of Ray Bradbury's "A Sound of Thunder"
Wilson Hall, the main building of Fermilab, looms like a giant “H” above the flat Illinois landscape. 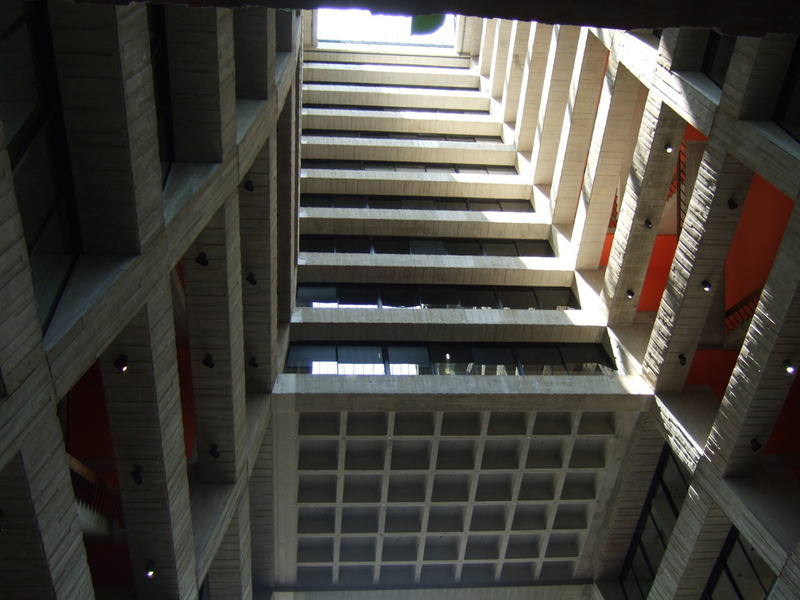 The atrium of Wilson Hall climbs to the sky like an infinite ladder. 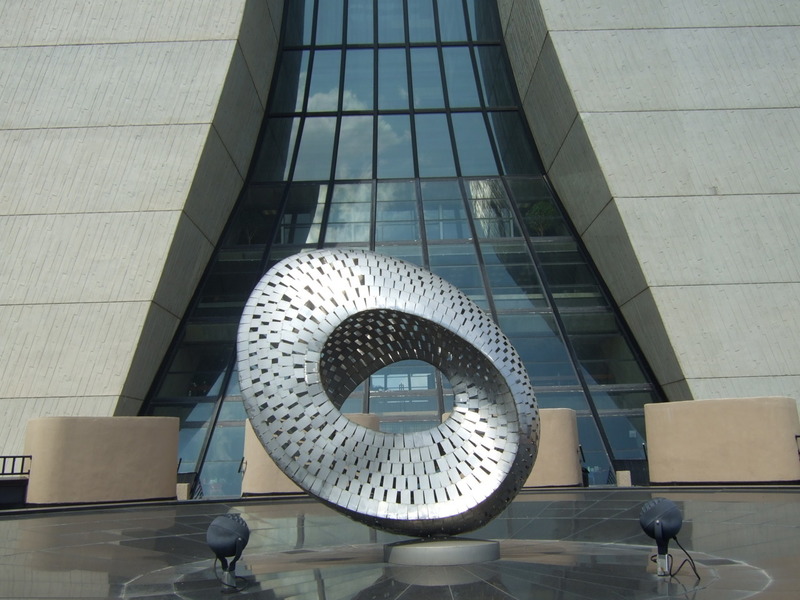 The sculpture “Mobius Strip,” designed by Robert Wilson, offers a wonderful intersection between science and art. As a long-time fan of PBS and NOVA, I was delighted to be invited to contribute to their new physics blog, The Nature of Reality. The topic I decided to write about is a cosmic mystery called dark flow. It represents a seeming movement of galaxy clusters toward a patch of the sky. Dark Flow: Tugs from Beyond the Observable Universe?